Adding a landscape to your outdoors is a great way to expand your living space and to enhance the aesthetic appeal of your property. And what better way to make your landscape come alive than to add koi ponds or water features. They make your landscape complete. Moreover, these are also the best choice if you want serenity and a unique ambiance in your outdoor area. 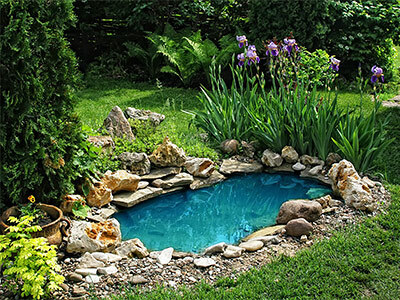 Some homeowners want the natural look of water elements by looking for properties with natural ponds or streams. But you don't have to do the same and spend a fortune on these features. Various water features can now be designed and built in your own backyard, regardless of where you are in California. When it comes to these types of landscape elements, we at Gilgert's Landscaping make sure that each project we handle exudes beauty, quality, and function unlike any other. We also welcome suggestions or ideas from our clients, because we believe that successful results can only be achieved with great collaboration with them. In case you are unsure of how to go about the design of your koi ponds, waterfalls, fountains or other water features, our team of creative designers and expert builders will assist you from planning all the way to completion. 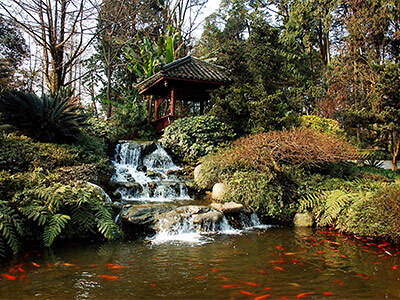 Koi ponds are usually seen in Japanese homes, and these ponds feature the Japanese Ornamental Carp or Nishikigoi. These attractive and brilliantly colored fishes provide a great visual element and a focal point to any landscape. A koi pond is usually built as a centerpiece in a landscape, so it is best to use natural stone materials and add real aquatic plants. We greatly consider the growth and the health of the fishes when designing Koi ponds. When it comes to building these water features, we only send builders who are experts in pond installation and are knowledgeable in handling this exotic fish from Japan. It takes a lot of skills and specialized tools and equipment to make sure that your pond works perfectly and that it would be a proper living space for your koi. Water features have always been recommended elements to add to any outdoor area. Not only do they break the greens and grays of typical landscapes, they also help relax the mind and the body. There are several types of waterscapes that we can design and build such as waterfalls, fountains, bird baths, ponds, streams, and a lot more. We add life to your landscape by ensuring that these features are installed in strategic locations in your property. There are several benefits to having koi ponds and water features around your home. Let us help you experience all those by giving us the opportunity to enhance your outdoor living space. You can choose from the wide variety of designs in our portfolio, or we can have one customized especially for you. Give us a call today so we could give you more information on how we can build these amazing features in your properties. It doesn't matter if you are not residing in Turlock, because we also build these features for clients from other California areas.